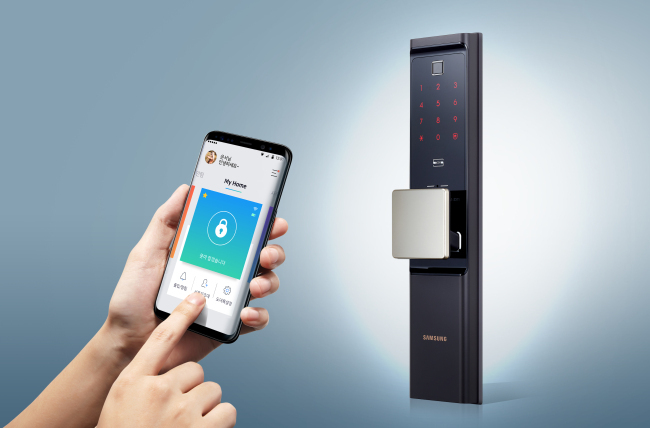 Samsung SDS, the information technology solutions unit of South Korea’s Samsung Group, said Wednesday that it has launched a new door lock that employs Internet of Things technology to connect to smartphones, for both Korean and global markets. The device, named the SHP-DR900, is equipped with a power-efficient Wi-Fi chip that extends battery life by two times, compared to existing devices in the market, the company said. It also informs users of their door status via a smartphone in realtime. Notifications are sent when the door is activated, and doors can be remotely opened via a smartphone. On the utility aspect, the smart door knob has a built-in sensor that can detect hand movement, allowing users to open the door with a slight touch on the knob. The device also comes with an upgraded fingerprint sensor that raises authentication accuracy, the firm said. To protect against hacking attempts, the smart door lock is equipped with in-house security software including the Samsung SDS-White Box Cryptography and Samsung SDS-Secure Encapsulation for Application Layer technologies, according to Samsung SDS.